With so many different roots and influences, no wonder it has enchanted and seduced such a diverse collection of peoples. There is an old joke about a young man walking the streets of New York City with a violin case under his arm. After failing to find the address he's looking for, he stops and asks the first person he sees for directions. "How do I get to Carnegie Hall?" he inquires. Without blinking an eye, the other man replies, "Practice, my dear man, practice." Ten years ago this prestigious hall, which has witnessed some of the best musicians and bands through the ages, hosted a "one-off" event featuring the Buena Vista Social Club band. It has been said that every artist who stands on the Carnegie stage is standing on history anchored by excellence. And surely, the Buena Vista debut cannot be described otherwise than as momentous. Beside becoming the all-time best selling record in the world music genre, the Buena Vista Social Club (World Circuit, 1997) studio album did something more than thatit promoted Cuban culture in a way that hadn't been done before (or since Tony Montana). The record was brimming with magic and full of songs from the vast trove of musical treasures with which Cuba is plentiful. 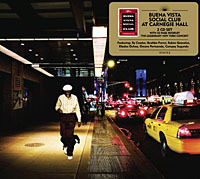 But the performance at Carnegie Hall on the 1st of July 1998 remains the pinnacle of the Buena Vista project. Ten years after the event, Buena Vista Social Club at Carnegie Hall has been, at last, releasedfor everyone who was there to remember, and everyone else to enjoy. It's possible that no music has ever appealed to so many people around the globe as has Cuban music. With so many different roots and influences, no wonder it has enchanted and seduced such a diverse collection of peoples. Somehow there is something for everyone. The island's music, instruments and dances are mostly of European (particularly Spanish) and African origin. Most forms of the present day are creolized fusions and mixtures of these two great sources. Large numbers of African slaves and European (mostly Spanish) immigrants came to Cuba and brought their own forms of music to the island. There were even Chinese indentured laborers later in the 19th century. All these peoples brought their musics and instruments and the plethora of influences spawned a myriad of styles. Since the 19th century, Cuban music has been hugely popular and influential throughout the world and has produced many celebrated artists and songs. Through the years, music has been the most exported Cuban product beside cigars, rum and revolutions. But the Buena Vista Social Club album, the Wim Wenders film and subsequent solo recordings by some of the participants were truly a revolution. Artists like these don't come along too often, and though some of them were well known and respected prior to Buena Vista, it took 70, 80 or 90 years for their 15 minutes of fame to come on a global level. The music throughout Buena Vista Social Club at Carnegie Hall is a deep pleasuremelodic and full of warmth. The songs beg for motion from the listener. "Chan Chan" will surely draw a smile on your face as soon as you hear the now familiar chords. It is impossible to remain still while listening to songs like "Candela," "El Cuarto de Tula" and "El Carratero," as they raise the temperature with impassioned vocals and faster tempos. The boleros"Quizas, Quizas," "Veinte Anos" and "Dos Gardenias"are magnificent. There are three tracks heard on Introducing Ruben Gonzales (World Circuit, 1997)"Mandinga," "Siboney" and "Almendra." As for guitarist (and producer) Ry Cooder, his performance may be surprising to those familiar only with his signature style. Here he's a tender and sensitive contributor who never dominates (check "Silencio"). Cooder nevertheless plays a key role in an ensemble that has produced a highly enjoyable debut. Glimpses of the triumph at Carnegie Hall can be seen in the Wenders movie, where the group is seen performing "Chan Chan" for their encore (not included on the audio disc), and when bandleader Juan de Marcos' aunt brought the Cuban flag on the stage. With high-spirited ecstasy sprinkled throughout this recording, Buena Vista Social Club at Carnegie Hall is a hard album to sit still through, and an even harder one to listen to just once. These songs recapture the magic of the studio record. They shine with the same glow and evoke an era that is long gone. Tracks: CD1: Chan Chan; De Camino A La Vereda; El Cuarto De Tula; La Enganadora; Buena Vista Social Club; Dos Gardenias; Quizas, Quizas; Veinte. CD2: Orgullecida; Y Tu Que Has Hecho? Siboney; Mandinga; Almendra; El Carretero; Candela; Silencio. Personnel: Octavio Calder: trumpet; Joachim Cooder, drums, percussion; Ry Cooder, guitars; Angel "Terry" Domech, congas; Ibrahim Ferrer, vocals; Roberto Garcia: bongos, cowbell, guiro; Hugo Garzen: vocals; Juan de Marcos Gonzalez: bandleader, coro, guiro; Ruben Gonzalez, piano; Pao Leyva: vocals; Manuel "Puntillita" Licea: vocals; Orlando "Cachato" Lopez: bass; Manuel "Guajiro" Mirabal: trumpet; Eliades Ochoa: guitar, vocals; Omara Portuondo: vocals; Jesus "Aguaje" Ramos: bandleader for Ruben Gonzalez, trombone; Salvador Repilado: bass; Compay Segundo; guitar, vocals; Benito Suarez Magana: guitar; Barbarito Torres: laoud; Alberto "Virgilio" Valdes: maracas, coro; Amadito Valdes: timbales.